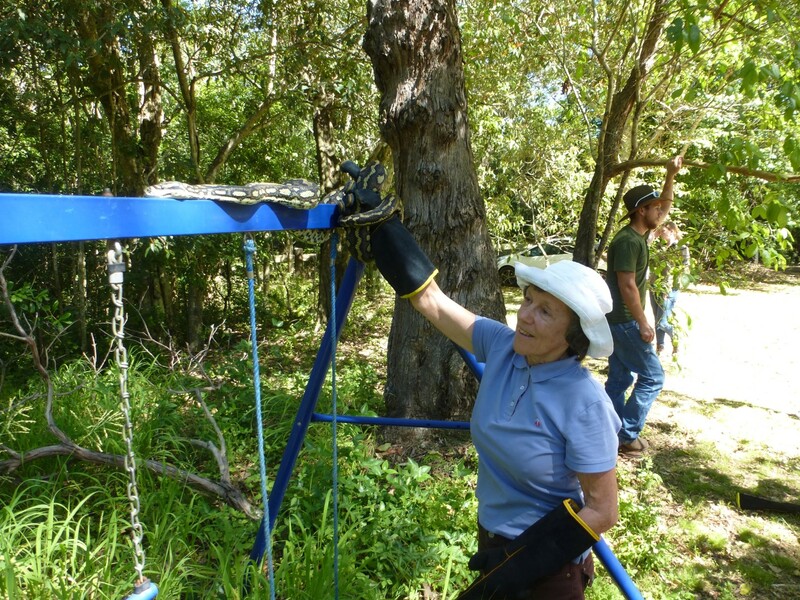 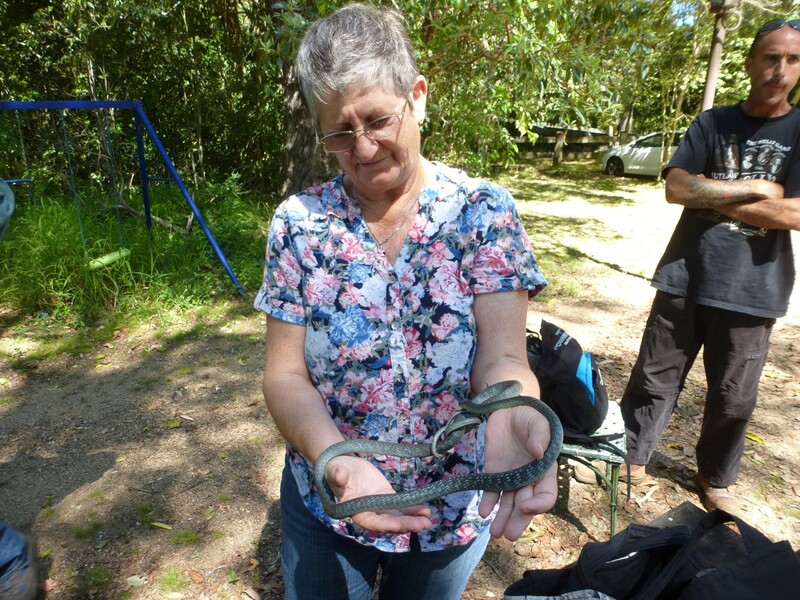 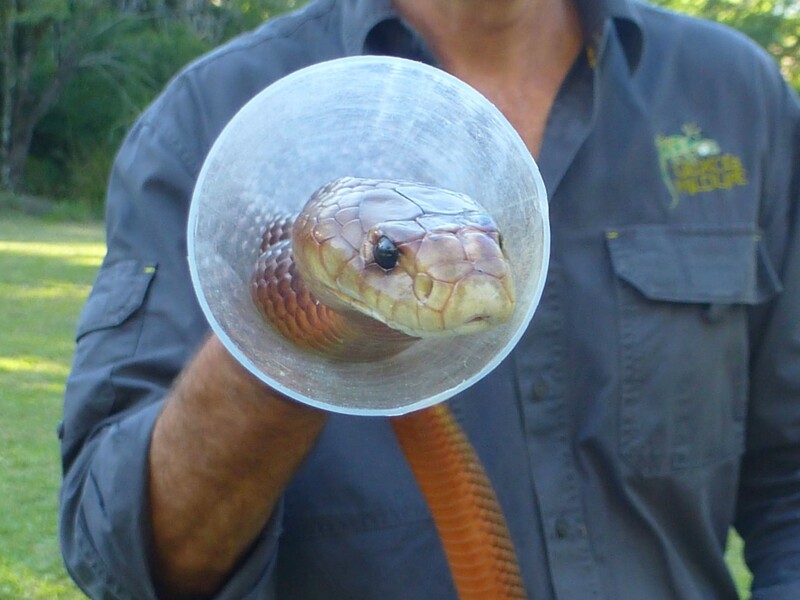 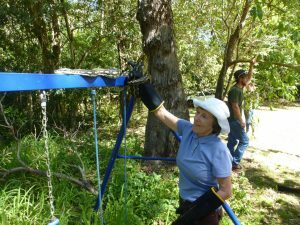 Wrestling with Venomous Snakes – Northern Rivers Wildlife Carers Inc.
Northern Rivers Wildlife Carers Inc. 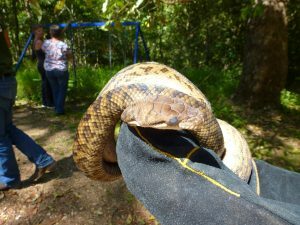 Article & pictures by Tom M.
Gabriela and I have been removing snakes from people’s homes for a few year’s now and have attended a number of non-venomous snake handling training days. 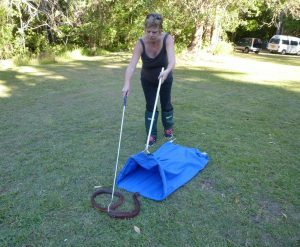 Whilst we have caught the occasional black snake, brown tree snake or baby brown snake, we have never felt fully confident dealing with venomous snakes. 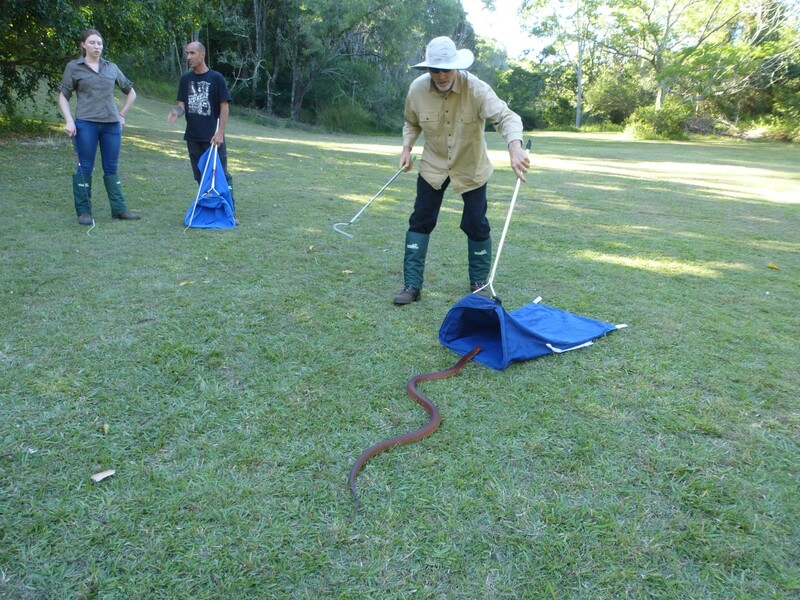 So when this recent venomous snake handling course came up, we finally stepped over the (mental) barrier and enrolled. The training was held on Sunday, 6 November 2016 at “Gecko’s Wildlife”, just under an hour’s drive north of Brisbane, which involved a three hour drive from Ballina. The day before the course had been very hot and the training day itself promised to be another hot one also. 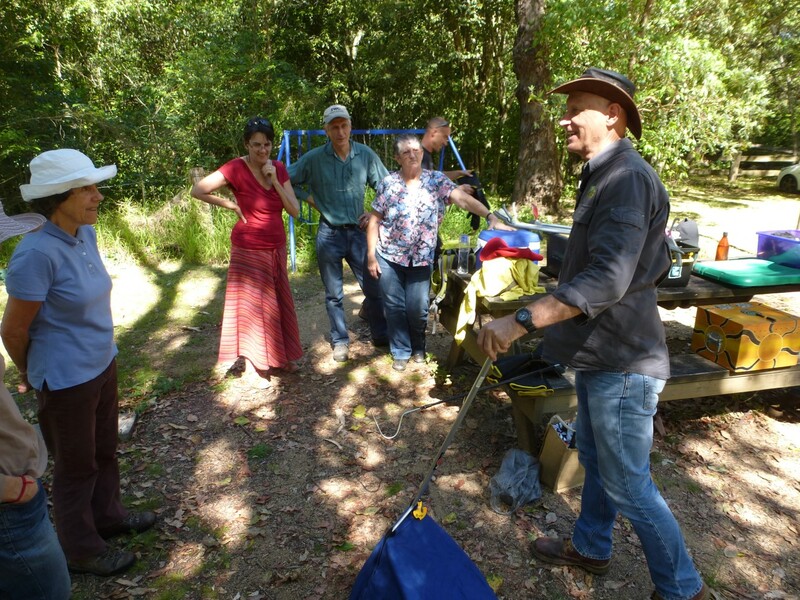 Kate had organised a bus for us to travel to “Gecko’s” as a group. 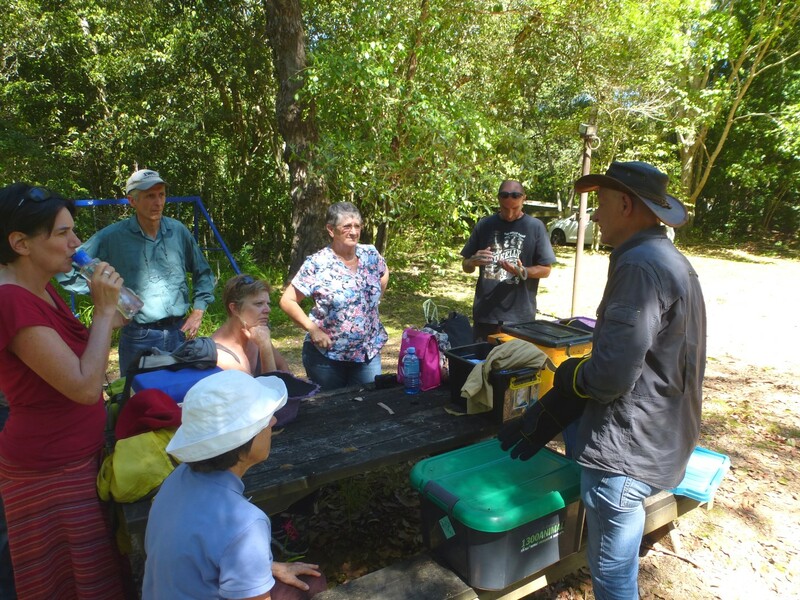 Meeting point was Bunnings in Ballina. 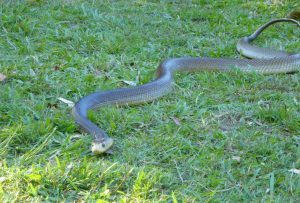 Julie had travelled up from New Italy and Lorraine had come from Casino, surely the ones having the longest day of us all. 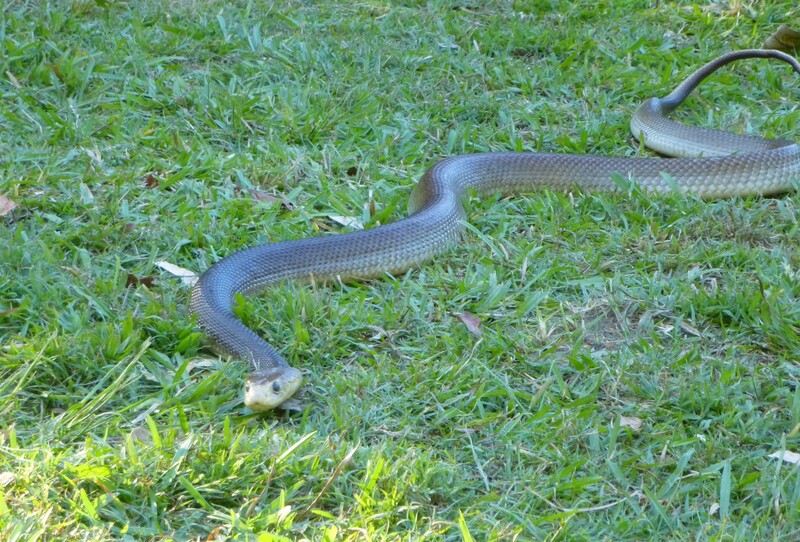 Rolf and Sandra had already gone up a day early, so as to be rested for the day of action. On our way north we also picked up Sue and Cameron (Cam is with TVWC). In all, we were a cosy group of 8 snake wranglers. We eventually arrived at “Gecko’s Wildlife”, eager for the course to begin. 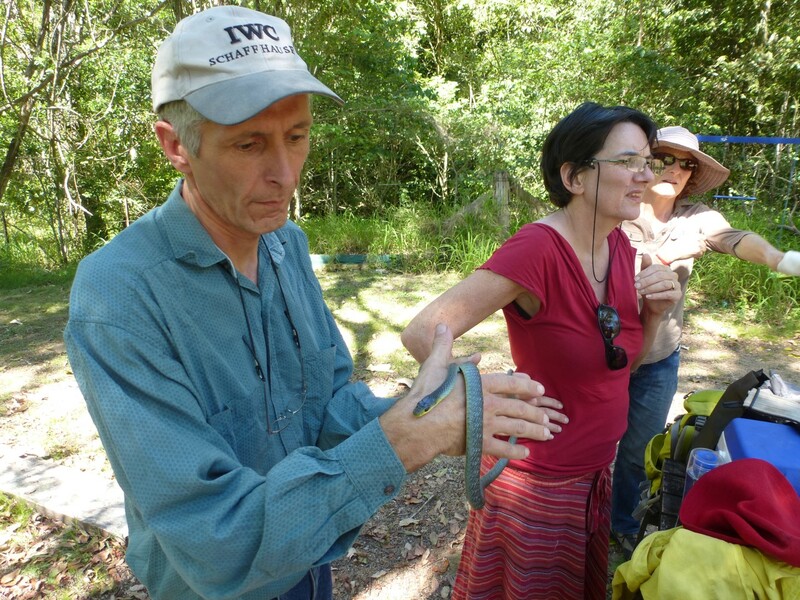 Martin Fingland who operates “Gecko’s Wildlife” welcomed us at the gate. 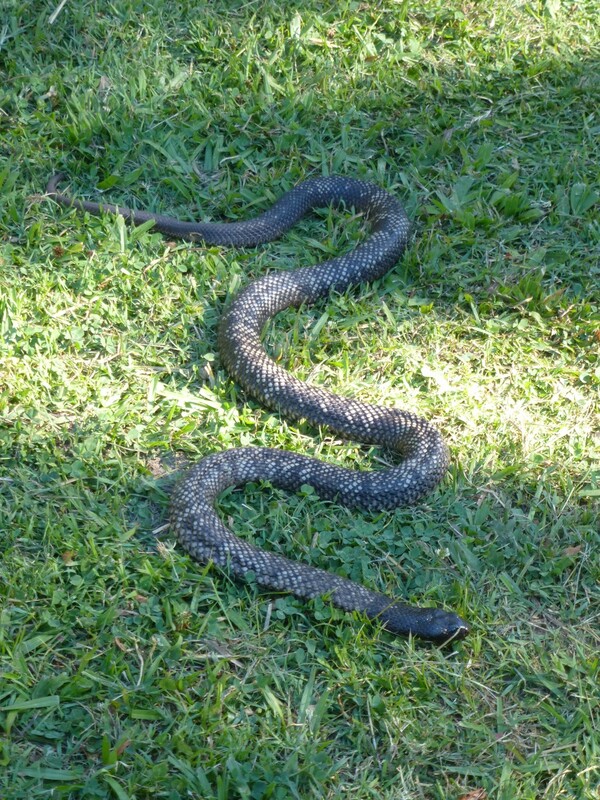 He would be our facilitator for the day. 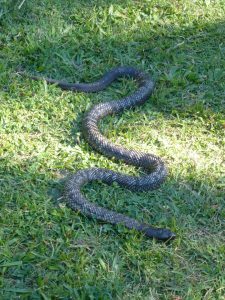 As we learnt more about Martin’s background, we realised that he is quite an authority in dealing with our slithering legless friends. 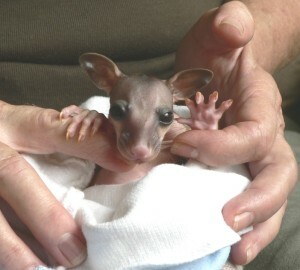 He is very passionate about what he does and I could sense his compassion towards all wildlife. 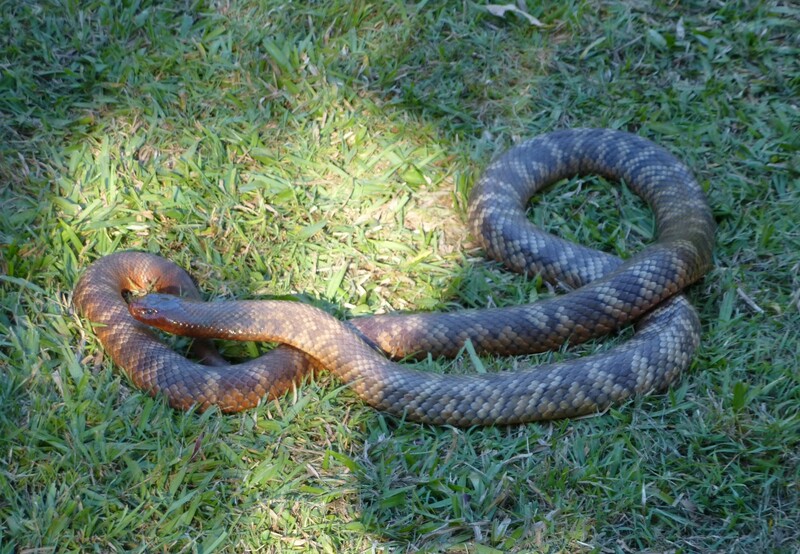 The theoretical part of the training consisted of general information on venomous snakes in Australia, their toxicity – something like 20 of the world’s most venomous 25 snakes all reside in Australia –, the do’s and don’ts of catching snakes, examples where bad approaches to catching a snake had had devastating health implications, as well as statistical information on envenomation through snake bites. For example, did you know that around 85% of brown snake bites are “dry bites”? 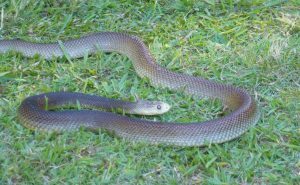 Recognising that for example a cow, horse or human are not suitable prey, the brown snake simply wants to make a point without wasting its venom. 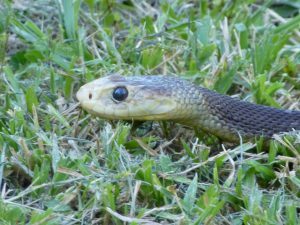 Speaking of venom, another interesting thing about snake venom is that not only does it serve to kill prey, but also acts as “digestive aid”, in that it dissolves the flesh of the eaten prey. 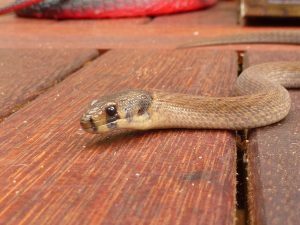 Of around 3,000 snake bites annually in Australia, only 300 require treatment and of these only 3-4 cases result in the death of the bitten person. After a short lunch break we went down to a nearby reserve for the practical part of the training. Martin pointed out the importance of acting in teams of two when dealing with venomous snakes, whenever possible. 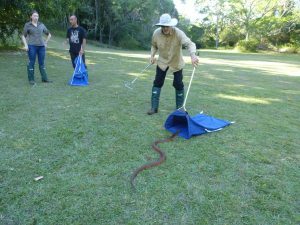 He also emphasised the importance of proper protective clothing/footwear and the use of suitable snake handling/catching gear. 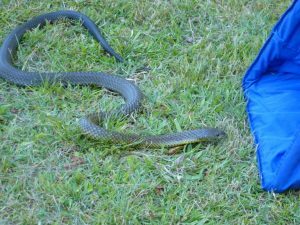 Whilst the primary goal has to be not to be bitten by a snake in the first place, he also talked us through the use of first aid, such as how to apply pressure bandages. As snake envenomation travels through the body via the lymphatic system (usually the venom would not be injected into the bloodstream), applying a tight pressure bandage is considered the best course of action until medical assistance is available. Catching venomous snakes today would be with bag and hook. 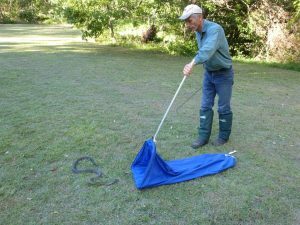 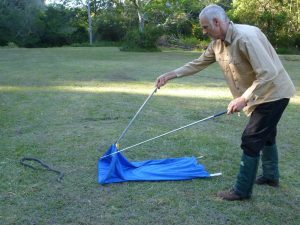 Martin demonstrated how a venomous snake can be securely bagged by observing a few essential points when using the hook and bag. 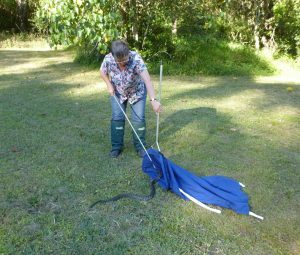 As most snake handlers would have experienced during non-venomous snake handling courses, a supposedly “securely bagged” snake would suddenly reappear out of the bag, before the bag could be securely tied. 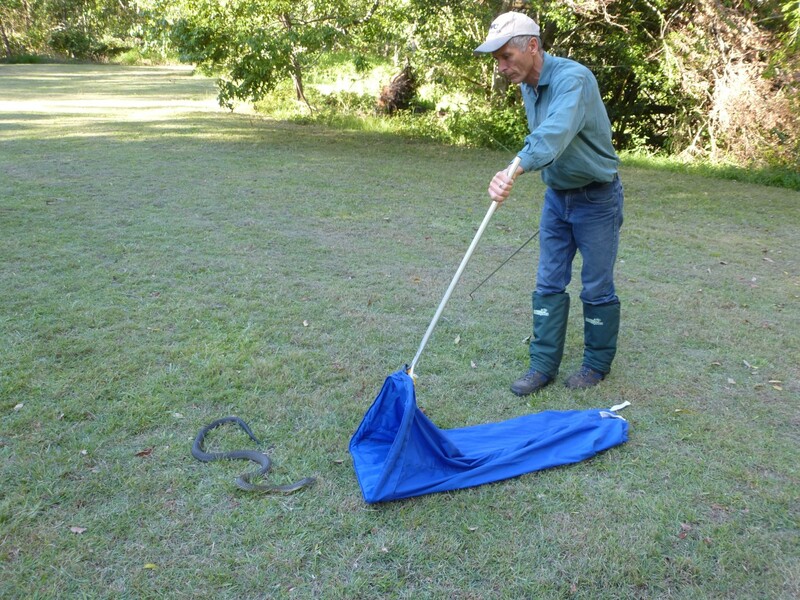 You would not want something like this to happen with a venomous snake. 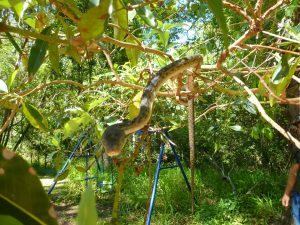 Martin and his two assistants placed a few “kind” (generally non-venomous) snakes in bushes and on a children’s swing for us to get “warmed up” with catching snakes. The two pythons as well as a green and a brown tree snake quite happily “hung in there”, while Martin gave us some further instructions. 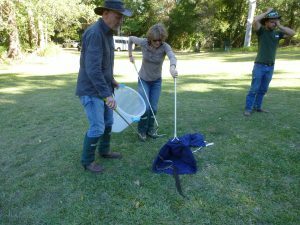 After all of us had had a go at bagging the “nice” snakes, Martin brought out the first venomous ones for us to catch & bag. 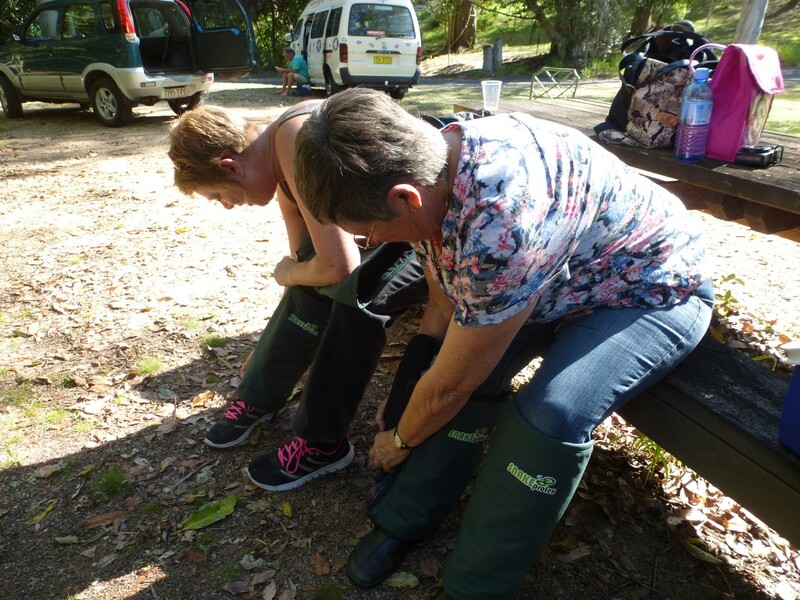 But not before we all had donned our protective gear, including special snake gaiters. And so, three or four of us in various locations around the reserve were allocated snakes to catch. 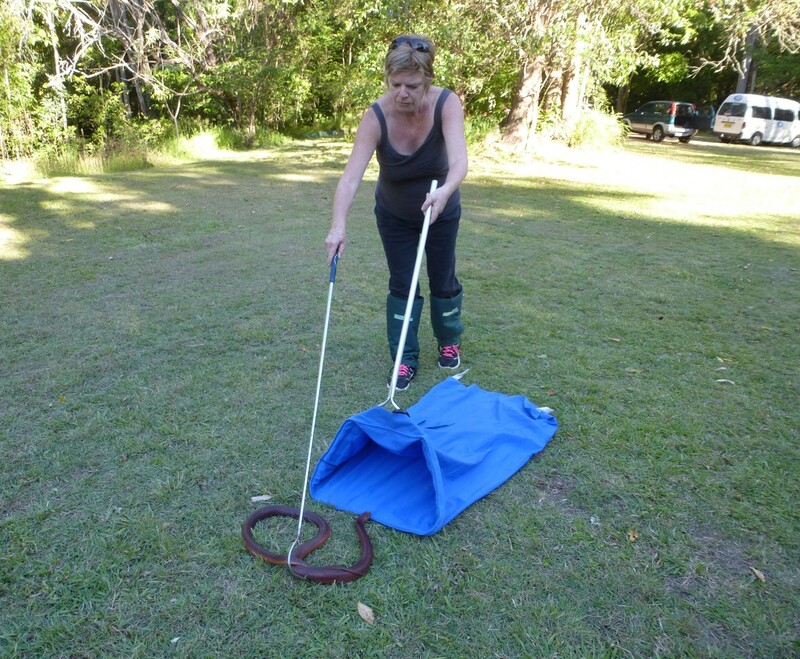 As “Gecko’s Wildlife” is home to a large variety of venomous snakes, we had plenty of types to train with. 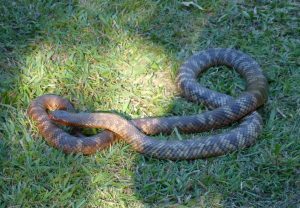 There were Collett’s, spotted and red bellied black, rough scaled, tiger, Stephen’s banded, death adder, mulga (king brown) and eastern browns to train with. 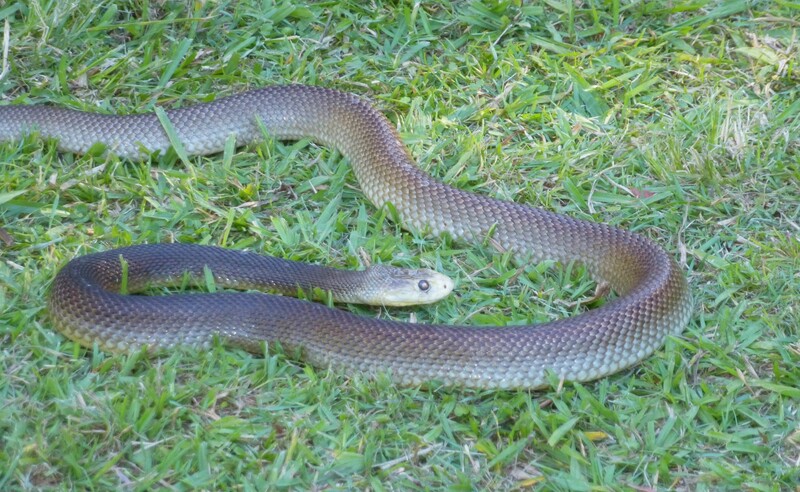 The coastal taipan at the end had a cruisy slither through the grass and remained unharassed by us; Martin decided to rest her, as she was about to shed her skin shortly. 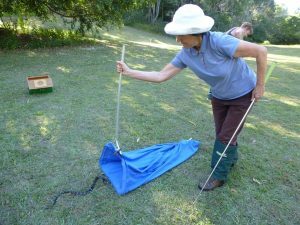 Whilst some snakes would willingly disappear into the presented bags, others, like some black and tiger snakes and especially the brown snakes, tried to avoid the bags like the plague. It was hilarious to watch us running across the paddock with bags flying in the breeze for yet another try to lure the elusive snakes into the bag. 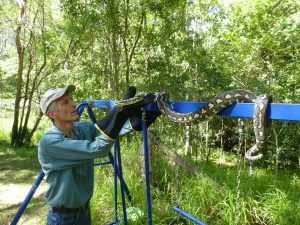 Sometimes it was only thanks to Martin and his RSPCA approved “gripper” tool that prevented some snakes from disappearing into the undergrowth. Martin also demonstrated the technique of “tubing” a snake. A transparent tube, slightly bigger than the thickness of the snake, would be held in front of the advancing snake. 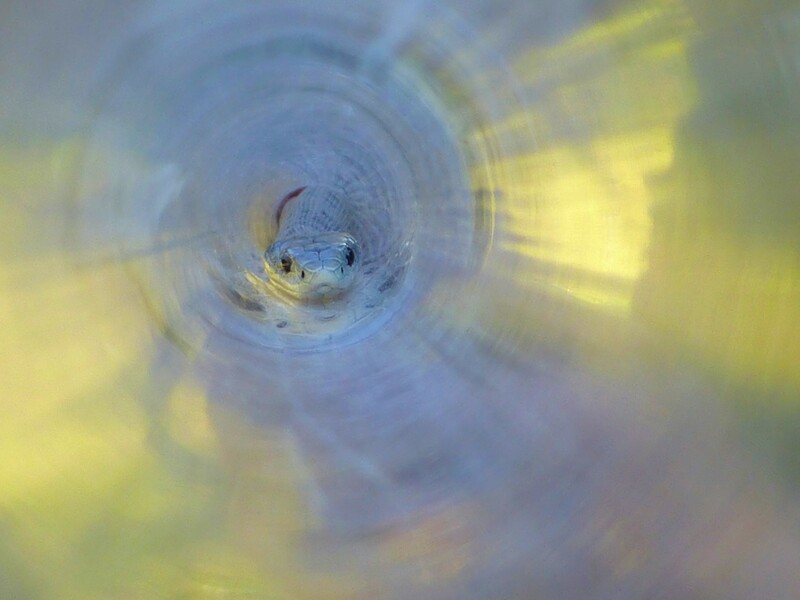 Eventually the snake would slither into the tube, making it easier to control and hold the snake. This technique is being used where for example the snake had to be safely assessed by a vet. 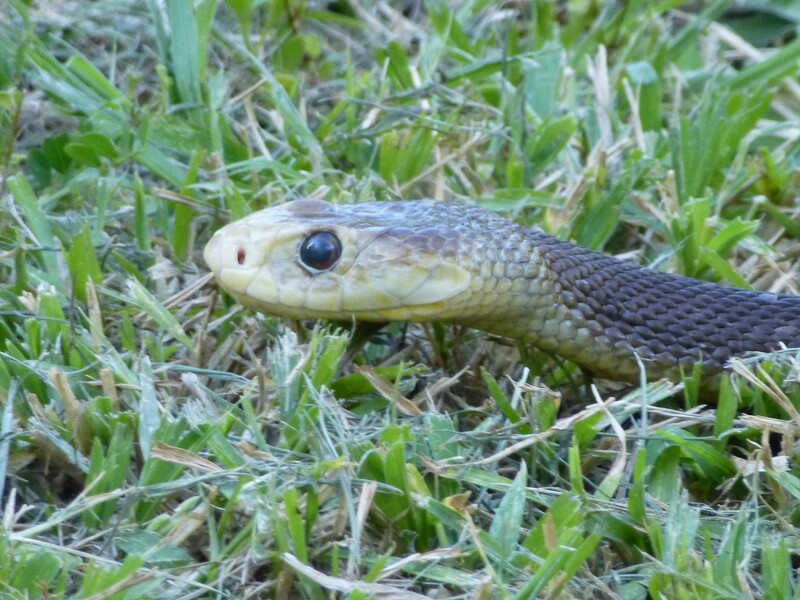 Even though most of our snake capturing takes place in home environments, usually furnished or rooms full of “stuff” like boxes, it was great to get face to face with these notorious elapids in the open reserve, where we could have multiple attempts at catching the snakes. 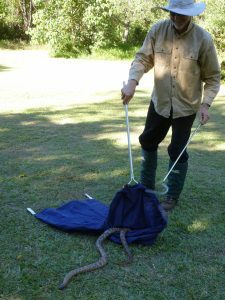 Martin also offers “advanced” courses, where venomous snakes are removed from confined spaces, from under objects or vegetation. So hopefully there will be a possibility for all snake handlers in our group to attend this one also. 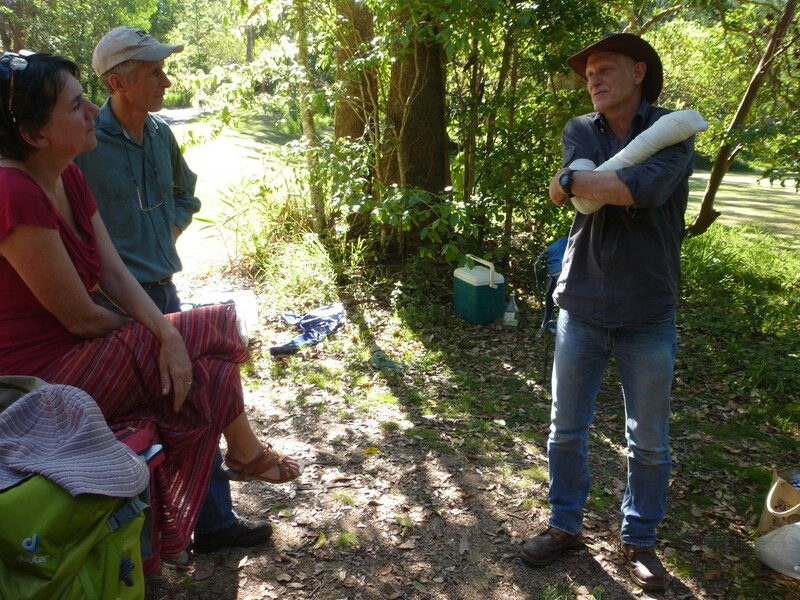 Overall, we all had a very enjoyable day out and learnt a lot. 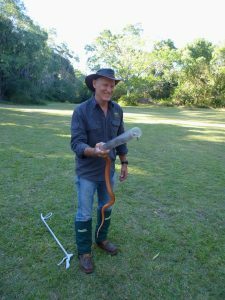 What resonated with me most is that whilst venomous snakes in Australia don’t have to be feared, they certainly deserve the utmost respect when dealing with them. 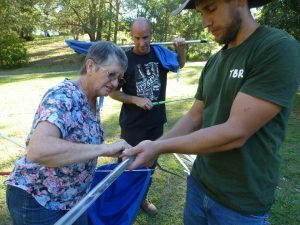 © 2019 Northern Rivers Wildlife Carers Inc.